Avtar Singh’s cataract-ridden eyes betray him. He is happy talking to the group of friends he has invited home, but he cannot help stealing fond glances at the lush green fields and trees he has grown single-handedly in the heart of a salt desert. Some consider the 92-year-old Sikh rude. “I am a proud Kuchchhi Kheru (Kuchchh’s farmer),” he says. “I have spent my life turning this desert into a fertile land.” Avtar’s farmland is in Panandhro village of Lakhpat, the last taluka in India along the Pakistan border. Avtar often speaks of his friend Gopal Singh who pestered him to come to Kuchchh from Punjab in the 1960s. Gopal received land here as a victory gift from the then Prime Minister Lal Bahadur Shastri for fighting in the Indo-Pak war in 1965. To keep the border safe and to create a second line of defence, Shastri had invited industrious and hard-working Sikh farmers to settle in the border areas of Kuchchh. This was also to turn the barren land green. 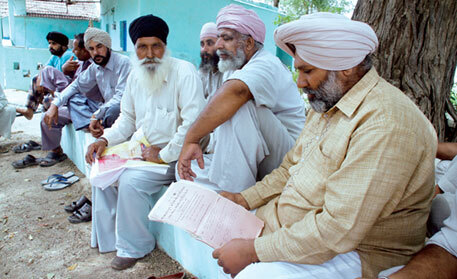 Between 1965 and 1984, the state government allotted land to 550 farmers of Punjab, Haryana and Rajasthan. Of these, 390 were Sikhs. Gopal and Avtar were among them. Today, more than 6,000 Sikh families are settled in Lakhpat and some disputed territories like Kori Creek and Sir Creek. Lakhpat is one of the many talukas in Kuchchh district where the Gujarat government has banned mutation, or transfer of ownership, of land. On October 22, 2010, district collector M Thennarasan issued a notice to 784 farmers with the subject line, “Freezing agriculture accounts of outsiders of Gujarat state”. The notice stated that as per the Bombay Tenancy and Agricultural Lands (Vidarbha and Kuchchh Area) Act, 1948, mutation of land on the basis of the existing farmers’ certificates cannot be done till further orders. Gopal could not take the insult of being called par pranti, or outsider. He fell sick and a year later died of heart attack. Today, hundreds of hectares are lying untilled in Kuchchh. Farmers cannot apply for power or tubewell connections. “We cannot sell our produce or get bank loans. Everything is tied to the mutation deed which is facing ‘freeze’ order,” says Avtar. “I know why chief minister Narendra Modi wants our land. He wants to give it to industries. I will die but not let the state government take my land away. It should take barren land to set up industries. Why does it want our fertile land?” he asks agitatedly. The answer lies in the huge reserve of good quality limestone underneath the farmlands. “There is so much limestone here we cannot even dig wells properly,” he says pointing to a heap of limestone that showed up when he tried to dig a well. Officials of the Gujarat Mineral Development Corporation (GMDC) keep coming to the fields with their machines to excavate the mineral, but farmers chase them away, he adds. According to the Geological Survey of India, Gujarat has 11,500 million tonnes of limestone, the most important ingredient for making cement. The state is the fourth largest producer of limestone in the country with 9 per cent share. 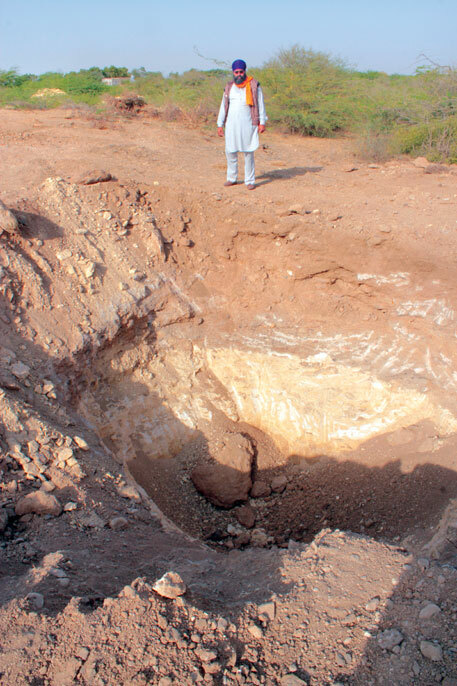 Of its total deposit, 7,700 million tonnes lie in Lakhpat, Abdasa and Naliya talukas of Kuchchh. This is enough to construct 128,325 20-storey buildings. If Gujarat taps the limestone reserve available in Kuchchh, the state will become the third largest producer of limestone in India with 15 per cent share. What’s more, underneath the limestone lie lignite reserves. Akri Mota and Lefri basins and Panandhro together have 220 million tonnes of lignite. Gujarat is the third largest producer of lignite in India. “To use lignite for the thermal power sector, the state government will have to dig out limestone first,” says Ramesh Bhatti of Bhuj- based non-profit Sahjeevan Trust. The farmers of Kuchchh, no doubt, are in the way of the state government’s plan of turning Kuchchh into “second Jamshedpur”. 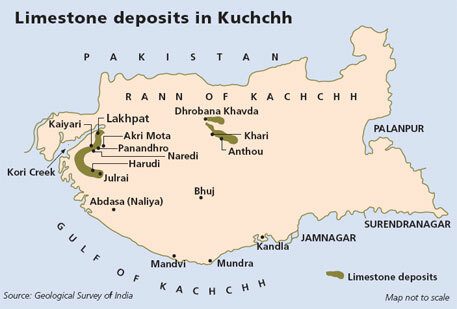 “With its vast mineral resources, Kuchchh has the potential to become an industrial city. By using modern technology and state-of-the-art infrastructure facilities, Kuchchh can be developed into a modern version of Jamshedpur,” V S Bajaj, director of Jaypee Cement, had said in a conference five months before the state government issued the land freeze order. The conference was organised by the Confederation of Indian Industry and GMDC. Just after “freezing” land in Kuchchh, in January 2011, the state signed Memoranda of Understanding (MoU) with various cement-based companies to help them set up plants. Some of the major companies include Anil Ambani Group’s Reliance Cementation Pvt Ltd, Associated Cement Companies Ltd, Adani Enterprises Ltd, Indiabulls Construction Materials Ltd and Calcom Cement India Ltd. In 2007, GMDC signed an MoU with Jaypee Cement to generate 6 million tonnes of cement in a year. The project is still pending. The corporation realised that acquiring land for plants of large capacity could be difficult. It now invites investment for setting up plants of smaller capacity. This time, it has signed MoUs with several companies with capacity ranging from 1.5 to 2.4 million tonne per annum. “If one company fails, another will succeed,” says a GMDC official on the condition of anonymity. During its Vibrant Gujarat campaign in 2013, the state government signed MoUs with 40 cement-based companies. These include Aditya Birla Group’s UltraTech Cement Ltd, Ambuja Cements Ltd, Binani Cement Ltd, Gujarat Sidhee Cement Limited and Saurashtra Cement Limited. The INDEXTB report gives a long list of infrastructural facilities available in Kuchchh to companies willing to set up plants in the district. But the ground reality is quite different. The report states that companies that wish to set up plants in Lakhpat can benefit from the 66 KV substation. Its transmission line passes close to Panandhro. However, about 10 years after it was installed, the 432 farmers’ homes in Panandhro and nearby villages are still dark. “We had met the electricity department officials asking them to bring electricity to our village,” says farmer Nirmal Singh of Panandhro. “The officials said we needed to deposit some money. Each household in the village contributed Rs 40,000 and gave the money to the department. Recently, the officials sent a letter asking us to take back the money because it cannot give us electricity,” he says. Nirmal worries that his children will never get to use computers and not be able to get good education. “The only bulb in our house is solar-powered.” Panandhro does not have potable water either. “There were three handpumps in the village. Two of these have stopped working. The one that is functioning gives salty water. We have no option but to drink that,” says Nirmal. His courtyard has a tap painted blue jutting out of the ground. “Every house has that. The state government installed it two years ago, but it is not connected to any pipeline,” he says. “These are deliberate attempts to alienate us and make us suffer so that we run away from the village,” says Avtar. Pointing at a 80-hectare farm, he says, “It was known as ‘jewel in the crown’ of this mini-Punjab. But its owners left the village unable to keep fighting with the state government over land. Since 2010, several families have left. No one knows where they went. They could not even sell their land because of the freeze order,” he says. The struggle began. In 2011, the farmers moved Gujarat High Court. “The Bombay Tenancy and Agricultural Land (Vidarbha and Kuchchh Area) Act, 1948 said that only an agriculturalist can buy land in Gujarat. I may be from Punjab but I am an agriculturist,” he says. “In court, the state government questioned the genuineness of our claim of being farmers,” says Surindar Singh Bhullar, who has been following the case on behalf of the farmers. It said there was no machinery to verify the certificates issued by other states which prove the status of a person as an agriculturist. But the court did not buy the state government’s argument. “If a state is ready to accept certificates of other states regarding the quantum of agricultural land owned by an individual for the purpose of ceiling, there is no reason why certificates regarding a person’s status as a farmer cannot be relied upon,” it said. 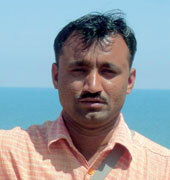 The farmers won the case in Gujarat High Court, but the state government went to the Supreme Court against the order. District collector of Lakhpat T J Vyas refused to comment because the case is subjudice. In Punjab, the issue was an embarrassment for the Shiromani Akali Dal and Bharatiya Janata Party alliance. Modi, BJP’s prime ministerial candidate for the ensuing general elections, drew flak from several quarters. But BJP had other plans. “In early January, it orchestrated a meeting with some Sikhs. Newspapers printed photographs and reports stating that the problem had been resolved and that no Sikh farmer would leave Gujarat,” says Nirmal. “But the Sikhs in the newspaper photographs were not even farmers. Their attire and expensive phones said it all. Worse, the report stated that the land freeze order will affect only 40 families,” he says. Now, even Punjab’s chief minister Parkash Singh Badal claims we are happy, he adds. If Modi genuinely wanted the Sikh farmers to stay in Gujarat, he should have reverted the land freeze order. “Why has the state government not withdrawn the case from the Supreme Court?” he asks. The case is being contested by Himmat Singh Shergill, who is now a candidate for Aam Aadmi Party (AAP) from Anandpur Sahib constituency. “Be it BJP, Congress or AAP, our sole concern is to get our land back. We will not stop fighing till justice is done,” says Avtar. Its all part and parcel of great, ambitious development,, development of few at the cost of millions sacrifice,, Heil development ! !